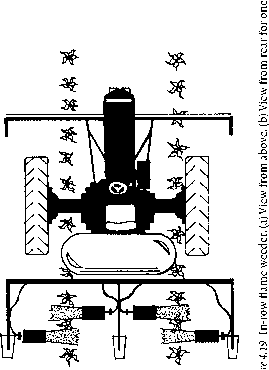 Weed populations usually have noticeably clumped spatial patterns. The most common pattern is for the frequency of occurrence of individuals to follow a negative binomial distribution (Zanin, Berti & Zuin, 1989; Wiles et al, 1992; Mortensen, Johnson & Young, 1993; Mulugeta & Stoltenberg, 1997). For wandering perennial species, much of the clumped pattern is the result of vegetative growth. Variation in soil fertility, tilth, drainage, and the density and vigor of the crop causes variation in plant size of both perennial and annual weeds. In addition, variation in the size, burial depth, and genetic constitution among seeds, and in the time of emergence of seedlings, leads to great variation in the size of annual plants. The resulting clumped distribution of weed biomass in any given year leads to a clumped distribution of density the following year, since reproductive output is correlated with plant size (e.g., Mohler & Callaway, 1995), and most weed seeds only disperse a short distance. Even if a weed is initially distributed uniformly across a field, as might happen, for example, if it were introduced in contaminated seed, the high variance in reproductive output among individual plants (Figure 2.6) guarantees that the species will quickly become clumped. However, the initial distribution of a species within the field is usually far from uniform. Often the weed expands from an initial point of establishment, either as an expanding front, or with new inoculation points appearing elsewhere in the field by intermediate-distance dispersal from the original site (Cousens & Mortimer, 1995, pp. 217-42). Some weed populations may be entirely maintained by dispersal from an adjacent habitat that is more suitable for the plant's reproduction. In such cases, the species is likely to be more common along the edge of the field (Marshall, 1989; Wilson & Aebischer, 1995). However, even weeds that are well adapted to farm fields are often more abundant along field edges due to soil compaction, lower crop competition, and inefficient application of herbicides and cultivation (Wilson & Aebischer, 1995). The persistent storage organs of perennial weeds and the persistent seed bank of many annual weeds insures that weed patches tend to remain in the same locations in successive seasons (Dieleman & Mortensen, 1999). Moreover, all the factors that disperse seeds within a field leave most seeds within a few meters (or less) of the parent plant. Consequently, once a clumped distribution of weeds is formed, it tends to persist. For example, Wilson & Brain (1991) found that Alopecurus myosuroides tended to occur in the same locations within a farm year after year. Patches tended to persist even through several years of sod. This is reasonable for a species with a persistent seed bank since dispersal forces are particularly weak after the seeds are in the soil, especially if the ground is not tilled. Thus, although variation in the soil conditions within a field doubtless contributes to the maintenance of some weed patches, the dynamics of reproduction seem sufficient to explain many of the clumped patterns observed. Dispersal also creates patchiness at larger scales. For example, McCanny, Baugh & Cavers (1988) repeatedly surveyed wild Panicum miliaceum populations in two Ontario townships, and found it present in 10% to 20% of the tilled fields. They found that the number of infested fields did not change much, but that the species had a probability of local extinction of 17% to 48% depending on the year. As some populations went extinct, new ones formed by colonization of previously uninfested fields. Perennial weeds and species with persistent seed banks probably behave similarly, but on longer time scales.